Fort Lauderdale, Fla., 2018-Oct-25 — /Travel PR News/ — The Central Florida Chapter of Women in Aviation International (WAI) recently hosted a “Girls in Aviation Day” event in conjunction with other chapters from around the world at Orlando International Airport to provide young women from Orlando-area high schools the opportunity to learn about the many career fields available in the growing aviation industry. The free event, attended by 40 girls in grades 9 – 12, was a team effort sponsored by United Airlines, Silver Airways, Flight Training Professionals and Sheltair, along with participating partners, including the Greater Orlando Aviation Authority K-9 Team, Wildlife Control and Aircraft Rescue Fire Fighters, Archer First Response Systems, Signature Flight Support Orlando, National Aviation Academy and Wings Financial Credit Union. 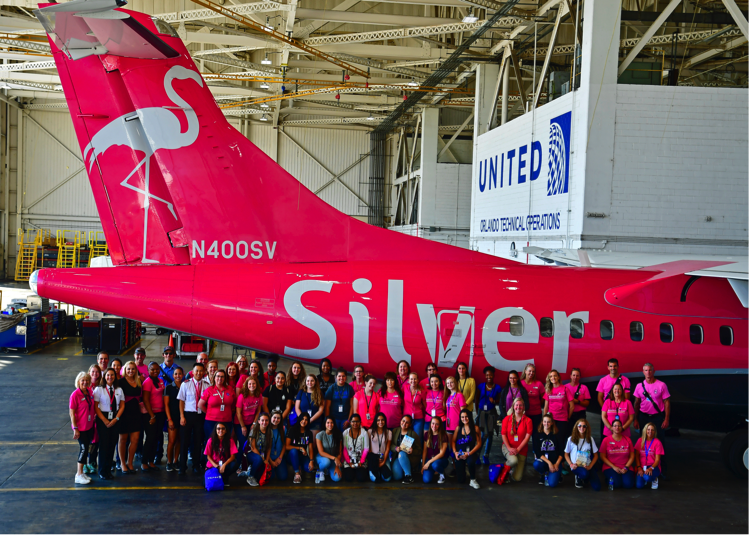 Silver Airways introduced the newest addition to its fleet – the ATR 600 – with its new pink flamingo livery. Silver Airways operates the most routes within Florida and between Florida and the Bahamas from its hubs in Fort Lauderdale, Orlando, and Tampa, and also operates Essential Air Service between Boston and Bar Harbor, Maine. In addition, Silver this year acquired Seaborne Airlines with flights in Puerto Rico, the Virgin Islands and the Caribbean. Silver is a codeshare partner with United, JetBlue and Avianca, and has interline agreements with American, Delta, Air Canada, Alaska Airlines, All Nippon Airways, Bahamasair, Hahn Air and Azul. Silver operates a fleet of highly-reliable Saab 340 aircraft, and starting in 2018, Silver is renewing and expanding its fleet with up to 50 new eco-friendly ATR-600s. Silver is honored to be the North American launch customer for the all new, redesigned ATR-600 offering best-in-class quiet cabins, premium leather seats with more legroom, and spacious overhead bins that accommodate full-size, carry-on roller bags. Silver is owned by affiliates of Philadelphia-based investment firm Versa Capital Management, LLC. To learn more about the refined passenger experience coming soon to Silver, visit SilverAirways.com/atr. This entry was posted in Airlines, Festivals and Events, Travel, Travel Services, Travelers and tagged Anna Perrin, Donna Hendrickson, Laurel Ross, Orlando, Silver Airways, ‘Girls in Aviation Day’. Bookmark the permalink.